Bargain notice: The MP3 soundtrack for Tangled is currently $3.99 on Amazon, considerably less than $11.99-$13.99 price tag I've seen elsewhere for the CD version . That's the price of four songs, of course, if you were wanting any of them or know kids who do. Use code GET3MP3S and get $3 in MP3 downloads instantly. Credit good for songs or albums sold at Amazon MP3. Offer ends November 30. No purchase necessary. 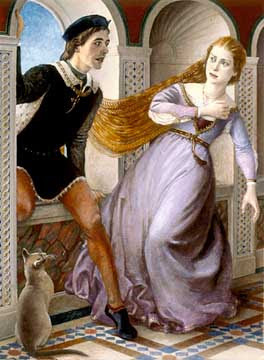 Rapunzel (Caldecott Medal Book) illustrated by Paul Zelinsky won the Caldecott Medal the year it was released. It is a beautiful book and one of my favorite versions of Rapunzel. It is based on the Grimms' version but the Italian style illustration hearken back to Petrosinella (Parsley) the Italian versions of the tale, a disconcerting dichotomy for me whenever I read it, I admit. I expect a different story with the illustrations. Not a complaint by any means, just a weird quirk of my over-informed Rapunzel brain. Still, this is one of my recommendations for anyone looking for a Rapunzel picture book. It tells the tale and teaches a little art history at the same time for overachievers. I was fortunate enough to hear Zelinsky speak a little bit about his experiences working on the book before it was finished. My memory is foggy, but I attended a seminar at Simmons College and his works were part of the gallery of art on display. He had just returned from Italy where he had been doing research for this book, so no art for it was on display. My biggest impression was that Zelinsky was quiet, not eager to talk. He lets his art speak for him, especially in large social situations. Over two years later when the book was released, I was thrilled with it. How lovely that the research and trip to Italy (never a hardship!) garnered him a Caldecott. Zelinsky also links to a lesson plan using his book--a wonderful lesson plan--by his wife, a school teacher. See the lesson plan here and click through and read the thought provoking questions either way. It combines a few disciplines, including art appreciation. Fables: The Deluxe Edition Book Two is a hardcover release of the third and fourth volumes of Fables as well as some extras. It was released on November 23rd and is a nice way to collect this series in a more permanent binding. And is less expensive than buying the first two volumes separately in paperback to boot. Also, on December 7, Fables Vol. 14: Witches will be released. This series just keeps going and going strong! The most recent Jack of Fables was released in June as Jack of Fables Vol. 7: The New Adventures of Jack and Jack while the next volume Jack of Fables Vol. 8: The Fulminate Blade is slated for a February 1, 2011 release. Fables: The Deluxe Edition Book One this one collects the first two volumes of the series as well as some extras. It was released last year. Fables: The Deluxe Edition Book Three if this one follows pattern it will contain the fifth and sixth volumes of the series when it is released in August 2011. Finally, if you are not familiar with the series, but remain curious, many sissues are offered online by Vertigo for reading. Check out the Fables page to see which issues are currently available. And warning that there is mature content, so don't offer this to your young ones. I assembled the tower then covered it with jelly beans and non-pariels. I then added details like Tart N Tinies and dragees and drew vines and flowers on the tower with royal icing. I drew the flowers and the hanging tower details with royal icing on wax paper. After they dried, I attached them. 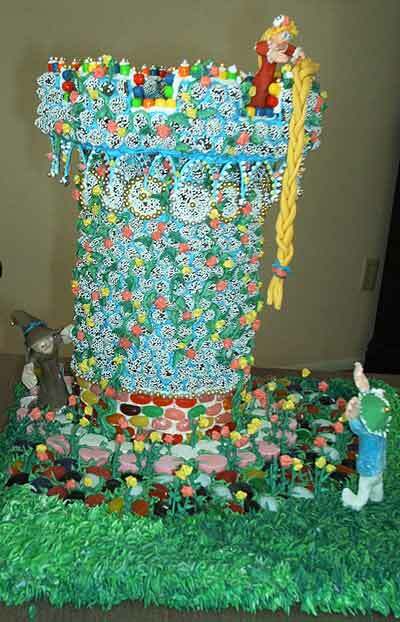 The grass is royal icing, applied with a grass decorating tip, with individual blades added between the "paving stones." Rapunzel, the prince, and the witch are colored rolled fondant, which I made from scratch, with royal icing details and rainbow sprinkle irises. I'm behind and still catching up so perhaps you are, too, and missed this. This past Friday gave us Fairytale Reflections (11) Megan Whalen Turner at Seven Miles of Steel Thistles. I'll admit now I saw the title and had a little "squee" moment because I am an unabashed Whalen Turner fan. I use her series to judge what books to recommend to readers. If you like her books, we will be about as full-blooded kindred reading spirits as it is possible to be in my experience. And I love introducing her series to the uninitiated. Whalen Turner (I have to use both names) didn't choose a fairy tale to discuss but instead discusses a collection of fairy tales and the illustrations that haunted her. When Katherine asked if I might like to write a blog post about my favorite fairy tale, I drew a blank. Having read the previous posts and their loving attention to various stories, I’m almost afraid to admit this, but I didn’t like fairy tales when I was a kid. I thought they were dry, their characters two dimensional and their plots predicatable. But as I wrote my e-mail, meaning to decline, one particular book did come to mind. It was Alice and Martin Provensen’s book of fairy tales, and I remembered it mainly for the illustrations, which were terrifying. I asked Katherine if that sort of subject would do for a non-fairy tale reader and she said, yes. So . . . It's an interesting twist on this series of author essays. And I admit that I went through a few years as a child feeling the same way about fairy tales as she does, rather put off by their generic plastic packaging in the most readily available anthologies. Then I remember picking up and reading Rapunzel in a non-illustrated collection and realizing, "Oh, my gosh! She's pregnant!" It blew my pre-adolescent mind and I was hooked. It is a vivid memory actually, I was laying on my bedroom floor wrapped in my sleeping bag on a cold winter night. In those days, I thought sleeping in my sleeping bag on the weekends made the days off from school more special. Kid brain! Although through most of my teen years I was drawn more to the novel and short story length retellings, such as from Robin McKinley and the Datlow & Windling series, I eventually came to obviously adore fairy tales on many levels. The Friday before last gave us Fairytale Reflections (10) Cassandra Golds at Seven Miles of Steel Thistles. Golds is an Australian author not well-known in the states, but after reading about her and her books, I hope she starts to get more publicity here. The first time I listened to it I remember sitting on the lounge in front of the big record player in my childhood home with an aching throat and tears streaming down my face. The Tale Spinners version — which, although dramatised, stuck closely to the Andersen original — was about unrequited love, self-sacrifice and the hope of ultimate transcendence. In other words, it was not the Disney version. And yet, at the age of five or so, none of it seemed foreign to me. Not only did I think this was the most beautiful story I had ever heard — immediately I conceived a passionate allegiance to it. From this point on, for me, “The Little Mermaid” was what a good story should be — sad, noble, uplifting, passionate, desperate, extreme and big, opera-big. And it had to make you cry. It was the first time I was ever moved to tears by a work of art, and I have never fully lost the conviction that that is art’s first duty: the gift of tears. And the dread hand of fate? Well, from the moment I first heard that record, I was destined to be a children’s author. It changed the course of my life. Or set me on it. Clair de Lune is also available for the Kindle for a great price , too. I wish the others were! The Guardian (UK) had a very negative response to the new trailer for Red Riding Hood. See Red Riding Hood trailer: life in the hood ain't so Grimm for a breakdown. Fairytales have always played a vital function, offering strict morality lessons that help to mould each generation of children into well-developed adults. However, now that they're primarily being used to sell subscriptions to satellite television companies, there's a real danger they may soon be a thing of the past. Hmmm, narrow view of fairy tales, but not surprising. But most of the attack is based on the Twilight tie-ins, from director to a love triangle, etc. Now, I'm not overly impressed with the trailer either, but I'm not going to rip the movie on a single trailer. I know trailers can be edited to make a movie look like anything. There's a whole genre of that kind of spoofing on YouTube actually. Not that I'm excited about the movie either, mind you. It does look rather silly so far... And so far the blogosphere agrees. This one will be somewhat dueling with Beastly, so that will be an interesting match up. I was saving Sugar Cane: A Caribbean Rapunzel by Patricia Storace and illustrated by Raul Colon to highlight later this week when I discovered it is bargain priced on Amazon right now. I wanted to post it sooner rather than later because bargain books can last for weeks or minutes on Amazon in my years long experience with them. Just follow the links and look for the bargain priced edition. It's there currently for $5.04 in hardcover. Great price at 70% off! Stolen away from her parents on her first birthday by island sorceress Madam Fate, beautiful Sugar Cane grows up in a tower overlooking the sea. With only a pet green monkey named Callaloo for company, Sugar Cane is lonely—her only consolation is her love of music. 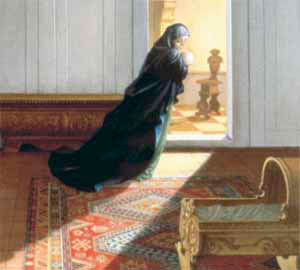 Often she stands at her window and sings, imagining that the echo of her voice is someone answering her. Then one night, someone does hear her song, but could this young man with a gift for music break the spell of Madam Fate and help Sugar Cane set herself free? 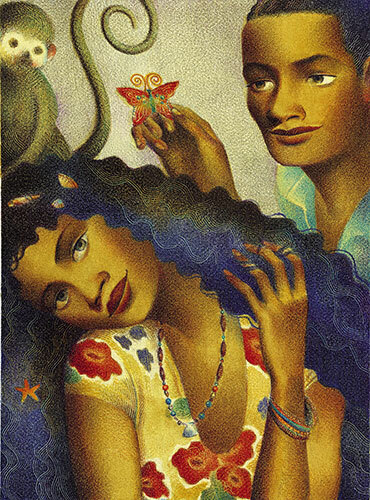 Patricia Storace’s lyrical and poignant retelling of the Rapunzel tale in a Caribbean setting is perfectly matched with Raúl Colón’s lush illustrations. An unforgettable feast for the senses. In other words, this is a literary retelling of the tale by Storace set in the Carribean. It is not based on a Carribean tale but is infused with Carribean culture. It is lengthy for a picture book, more short story than short tale, but it is beautifully told and offers a different culture to the well-known European versions. The quirk is that so many of the tales told in the Americas are adapted from European versions that came with the European colonists of various countries, so excepting the literary details and length, the tale feels like it belongs firmly in that culture. The only concern for giving it to younger children is the length. This is not a sit down and read it in one sitting with your four-year-old book. It's excellent for an independent reader though and reading over a few nights with an older child, merely thanks to length. 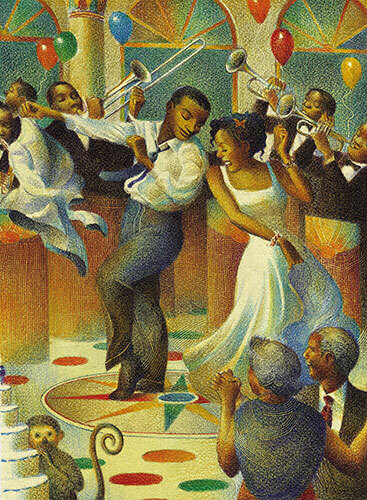 This is part of a series of books from Hyperion imprint, Jump at the Sun, which seeks to offer "minority" versions of tales, primarily African American. And Hyperion, for those not in the know, is a Disney owned company. There are many excellent fairy tales published by the imprint, mostly in paperback. Sugar Cane: A Caribbean Rapunzel received special attention with a hardcover edition. Edited to add: All of these posters are still available, but not all the affiliate links work (always a problem with Art.com's affiliate system), so search for Rapunzel (or other fairy tale or non fairy tale stuff) once you are on the site. The Best Offer of the Year! This really is one of their best deals that isn't offered very often anymore. I also provided Rapunzel poster choices for the fun of it. 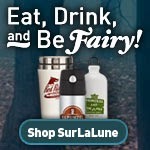 And, yes, SurLaLune is an Art.com associate so these are associate links.